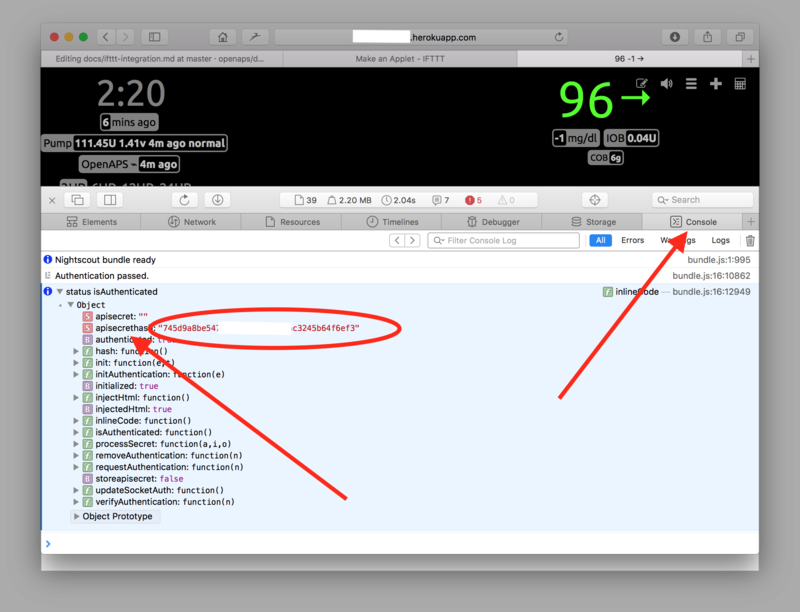 In your internet browser, open a console window while viewing your Nightscout site. Make sure you have “authenticated” your site by using your API secret in the Nightscout settings area (hint: if you see a little padlock in the upper left corner of the site, you haven’t authenticated it). Refresh the site and your hashed secret key will be shown as “apisecrethash: “xxxxxxxxxx...”” For Safari users on Mac, you can open the console window by selecting “Develop” from the Safari top menu, and then “Show Page Source” (if you do not see “Develop” in the top menu, activate it by going to Safari > Preferences... > Advanced, and checking the “Show Develop menu in menu bar” option). If you’re having problems seeing the apisecrethash, click the little grey triangle next to the “status isAuthenticated” line and the objects below it will display (see screenshot). Your hashed API secret can be copied and pasted from that line, as shown below. Save that somewhere easy to get to again, because you will be using it later. 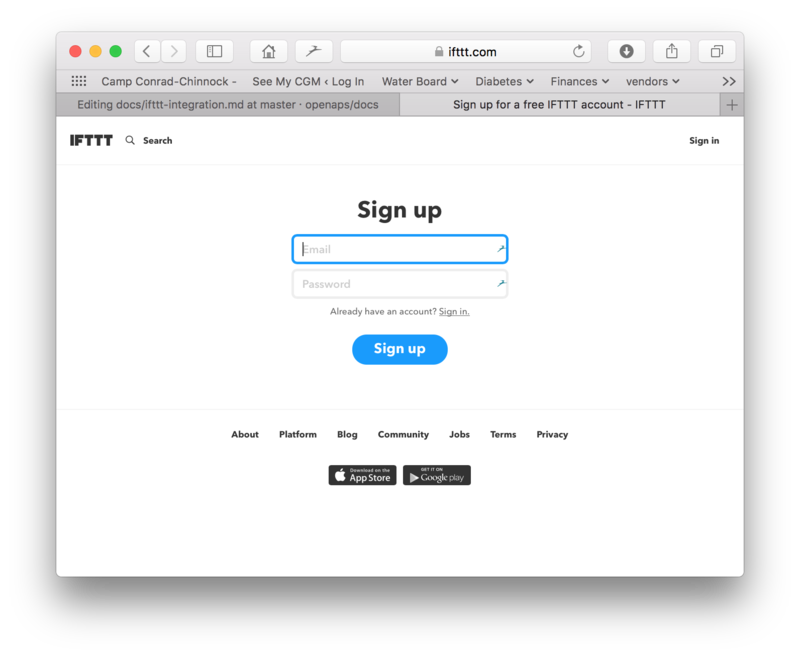 Login to your IFTTT.com account and select the “New Applet” button. Connect the buttonwidget by clicking on the large red “connect” button. Note: Connect button only appears on the first applet in a new account. Once it is connected it does not need to connect again. Connect the Webhooks app. Note: This connect button also only appears on the first applet in a new account. Once it is connected it does not need to connect again. Now you will have a blank web request template to complete. Click the “Create Action” button on the bottom of the screen when you finish. Now is your chance to change the title of your Applet now to something meaningful. You can turn on notifications, too, using the slider shown. If you turn on the notifications, you will get an alert on your phone and pebble watch when the button press has been successfully deployed. 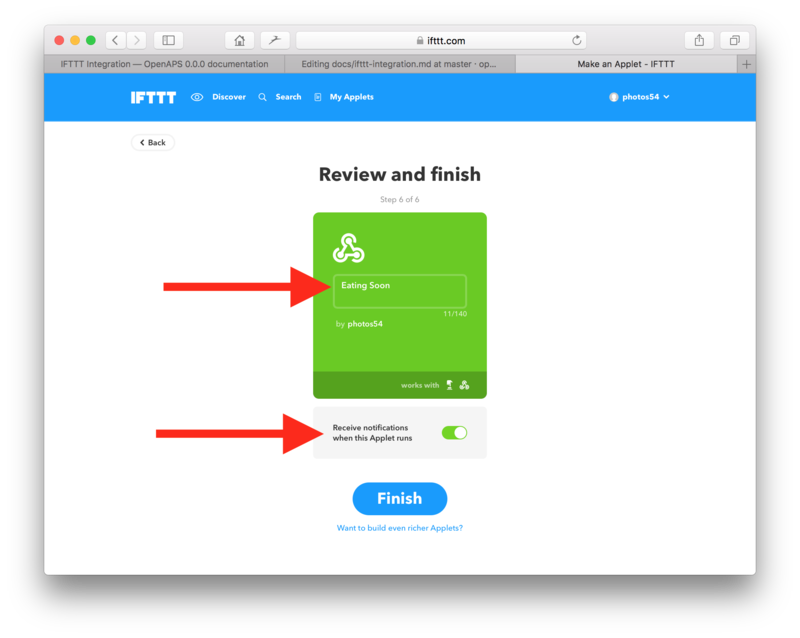 Finish the IFTTT button by clicking on the Finish button that appears. Repeat the setup for New Applets for as many automated actions as you would like to setup. 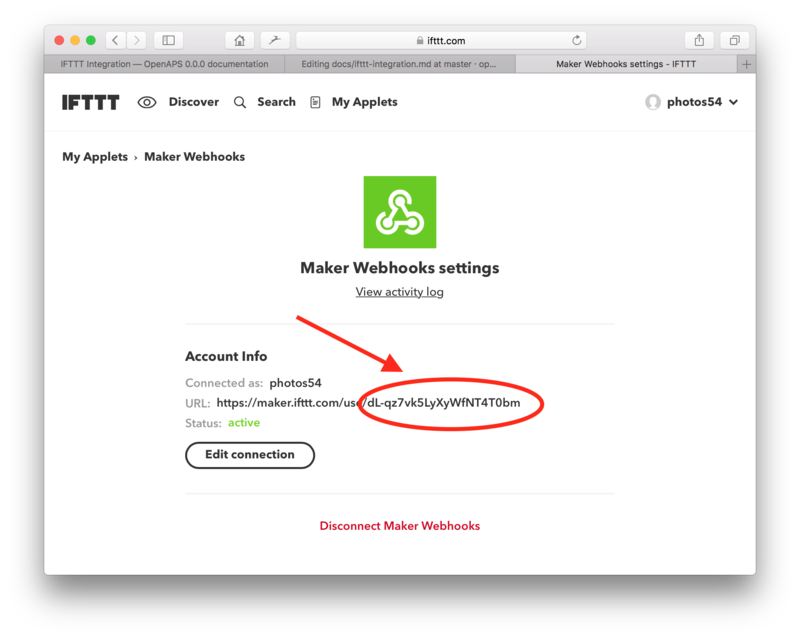 Find your Maker Key by going to your IFTTT account, Services and then clicking on Maker, then Maker settings. Login to your Nightscout site host (azure or heroku) and (1) add your Maker Key to the MAKER_KEY line and (2) add “maker” to your ENABLE line. 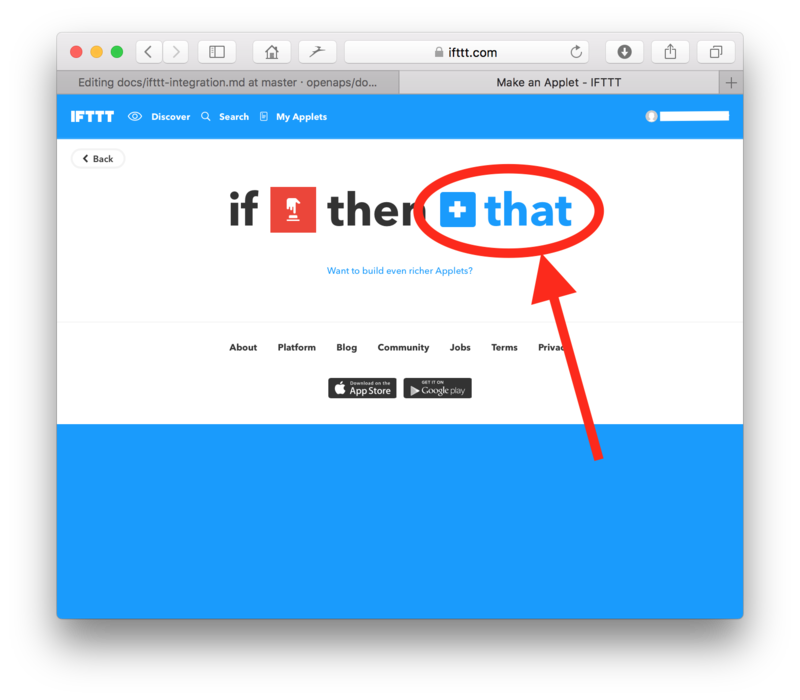 Download the IFTTT app on your phone and log in. You can add homescreen quick buttons. 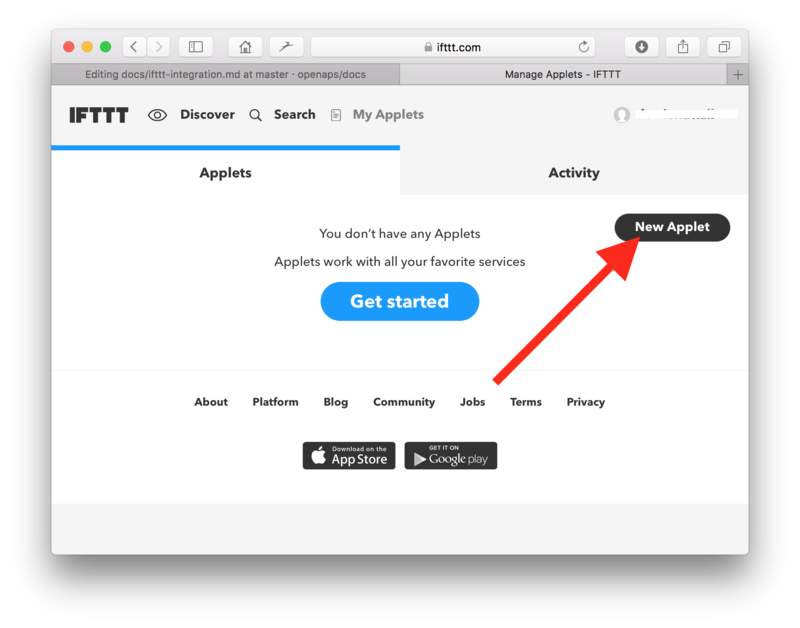 Click on your IFTTT app and login, click on My Applets in the bottom right corner, and then click on the applet that you’d like to work with. From the middle of the applet, click on the Widget Settings, and then click on the Add button for the Homescreen Icon. For iPhone users, if you downswipe from the top of your iPhone screen, you will have the Today view or Notifications showing. They are separate pages; Today view is on the left, Notifications is on the right. You can left/right swipe to go between them. Go into the Today view and scroll to the bottom, click “edit”. This should show a list of existing widgets, followed by a list of “more widgets” with green + signs. Click on the IFTTT’s green circle and the widget will be moved to the top, active widgets area. You can hold your finger on the three left lines of the IFTTT widget row to drag it to the top of your widget panel, if you prefer to have it as the top-most widget. click and hold the three lines that appear on the right side of the widget that you want to move. Drag the widget to the order in the list that you’d like it to appear in your widget quickscreen. 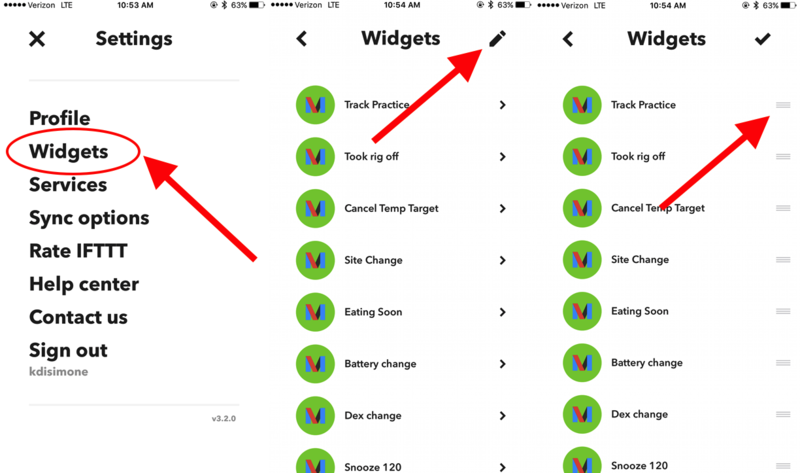 Workflow is a helpful app that can be displayed on the Today widget to easily enter custom carb entries (rather than relying on pre-set amounts) and also custom temporary targets on the fly. Install the Workflow app on your phone from the App Store. Click add widget to add the widget to your phone and follow the directions to force touch the Workflow app. After you click the Add Widget button that pops up, click the home button on the iPhone. Swipe left to get into the Today screen. Scroll down to the bottom and click “edit” to see a list of available widgets. 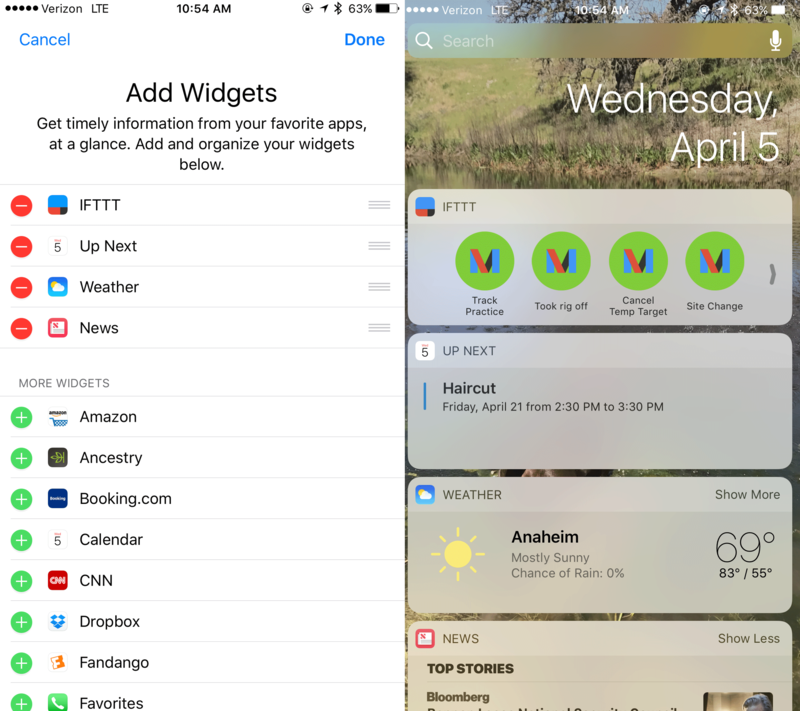 The Workflow widget should be on your active widgets list now; you can drag it up to be toward the top, using the three horizontal lines, or wherever you want it placed. Click Done. Open the Workflow app on your iPhone. From your iPhone’s browser app (e.g., Safari), open this page and click on one of the below links to download one of the community’s three recommended workflows. The workflow will open in the Workflow app. Click Get Workflow and then Open. You’ll then see the workflow in the app. Click on the Create Applet button. 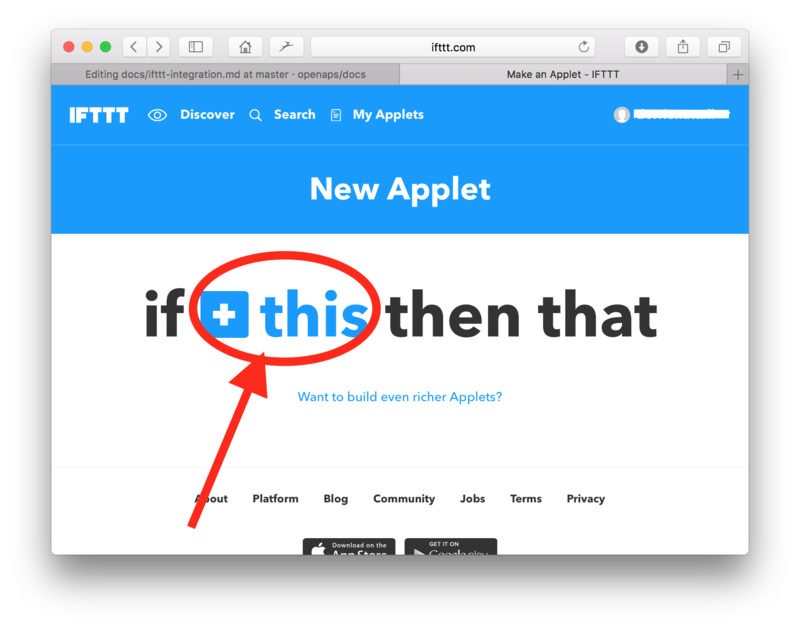 Click Open to open the IFTTT app. 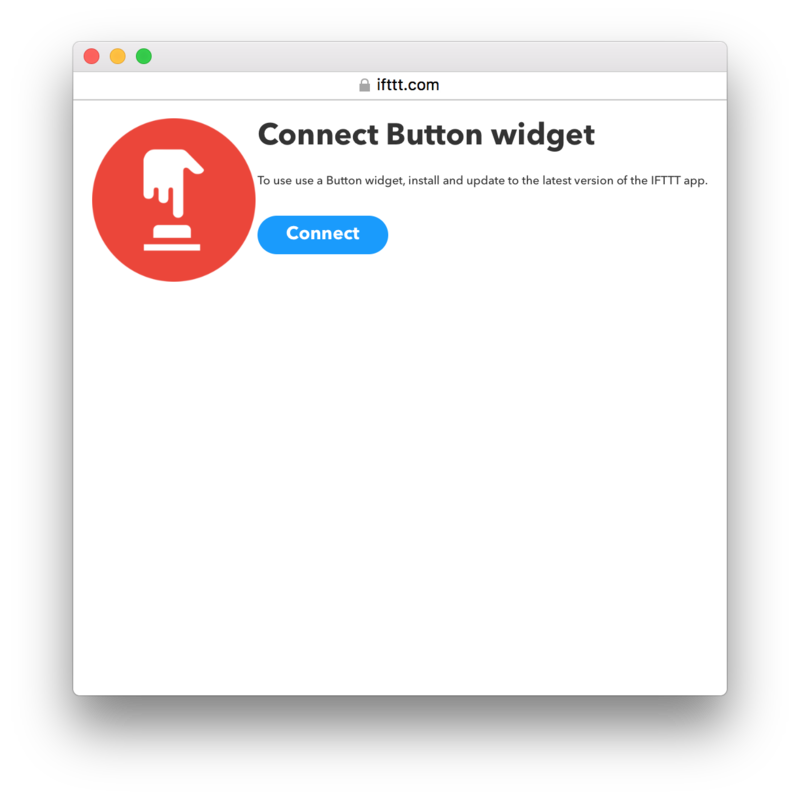 In the IFTTT app click Connect in the upper right corner; click the green Authorize button; and then click Open to Open in "IFTTT"?. Side Note: Steps 9-10 recommend some copy/paste of the body text to make life easier. If you use your iPhone to type in the body text in Step 10, the iPhone will enter ‘curly quotes’ rather than ‘straight quotes’. Curly quotes will break the IFTTT applet and is usually the main cause of setup errors. If you find that copy/paste of the body text is too difficult on the little iPhone screen, you can alternatively start Step 9 by logging into your IFTTT account on a computer and starting a new applet creation there. The actions are very similar to creating the applet on your iPhone, just the copy/paste part might be easier. Scroll down a bit to where it says Try making your own Workflow Applet from scratch. Click the New Applet button. On the recipe builder, click the blue +this and select or search Workflow, then select A workflow is run. Select EatCarbs, BottomTopDuration or tempTarget from the drop down for the trigger to use. Click the Next button in upper right. Click Next in the upper right corner. You can edit the title of the applet and then click Finish. 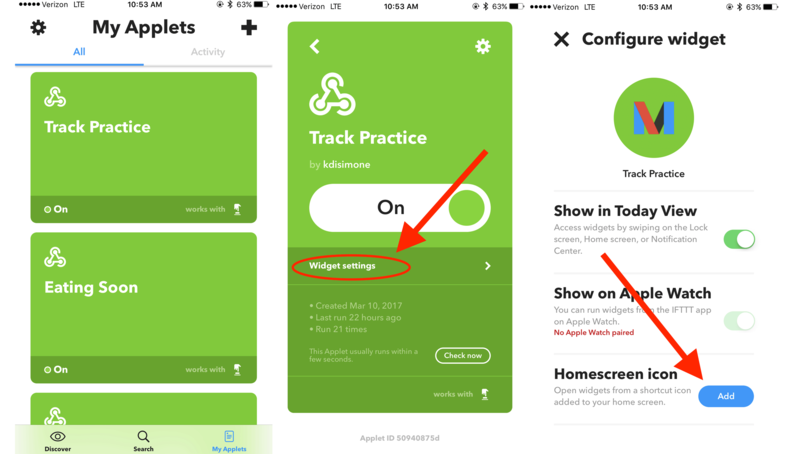 You can test your applet by going back to your iPhone’s Today widgets and clicking on the Workflow button you just created. You can also test inside the Workflow app by pressing the play button at the top of the workflow. 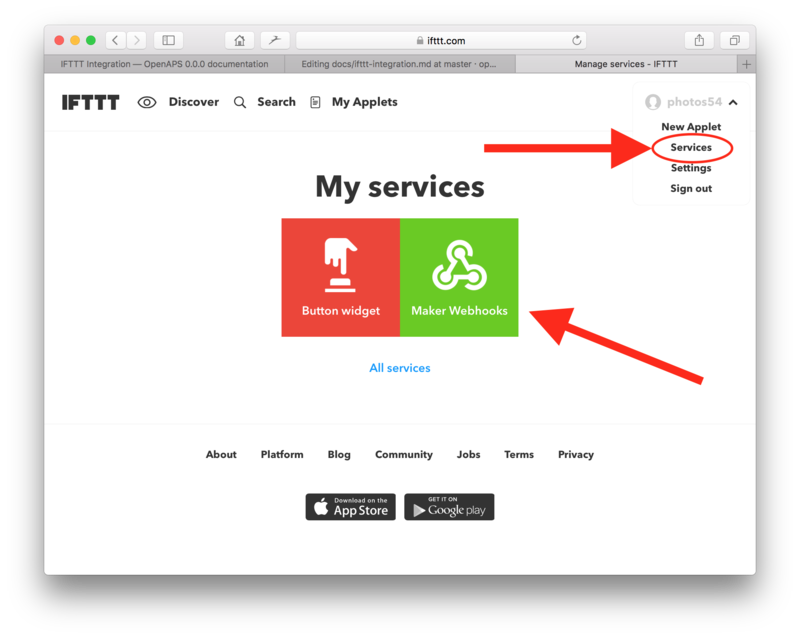 You can confirm a successful run by looking at your Nightscout site for the carb entry/temp target bar, or by looking at the activity log of the applet in IFTTT. WARNING/REMINDER: If you have SMBs turned on, do NOT try with large carb amounts. Only test with 1 carb entries! Ditto for temp targets - test a 99 or 101 mg/dl target or something conservative to not trigger SMBs. You can delete the test entries via the Reports tab in your Nightscout site, choosing the Treatments tab, and finding the recent entry. Load the ThisButton app from the Pebble Store. Event: the name of the Maker event to fire. It will have underscores in it like: eating_soon. Enter all the different events you created here and submit them. 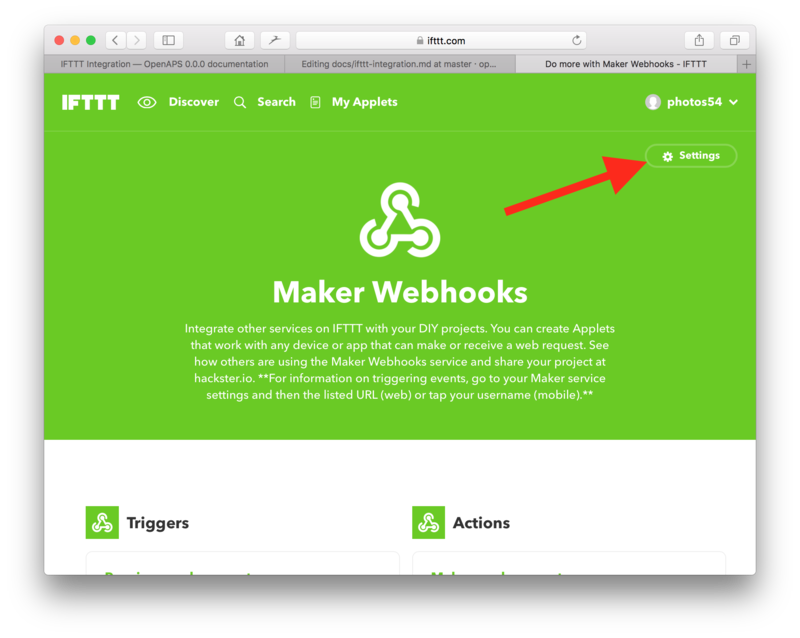 You will need to create new IFTTT recipes with THIS as the Webhooks “Receive a web request” trigger. 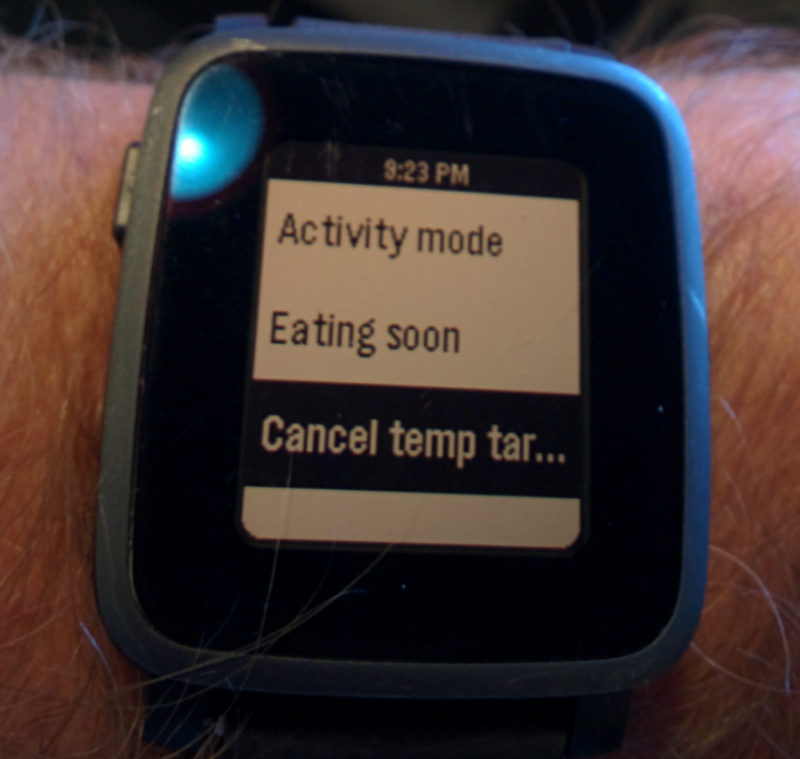 Fire up the ThisButton app on your Pebble and try setting a new temp target. You can also add the ThisButton app as a short cut on your Pebble. If you don’t have shortcuts already, press and hold either the up, down, or middle button and follow the prompts. If you have both shortcuts programmed and want to change one, go to menu > settings> quick launch and follow prompts. Note: ThisButton does not work on Pebble Round watches. You can search for IFTTT apps in the pebble store and choose one that is similar, however. The concept of setting up the events is similar. 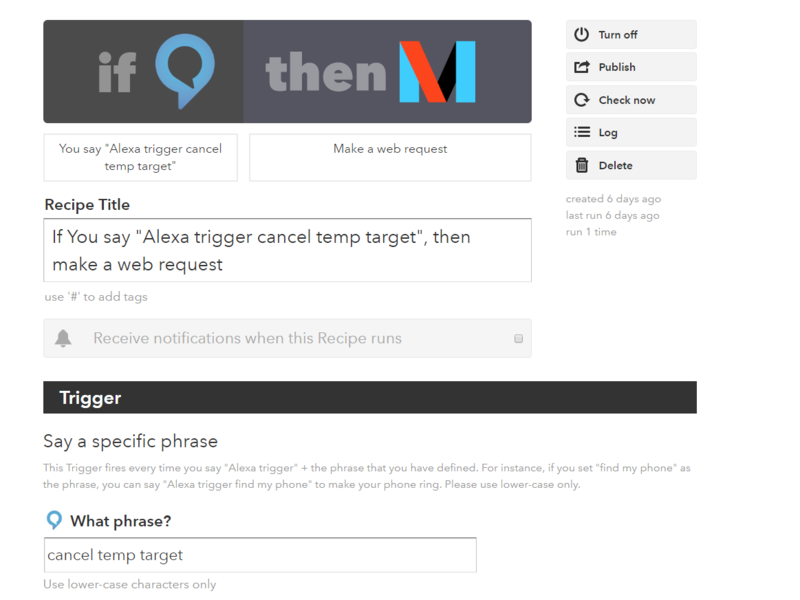 Since you have IFTTT/Maker requests working, you can get it to work with anything that supports IFTTT, including Alexa. You will need to add “alexa” to your ENABLE line in your Nightscout host settings (azure) or config vars (heroku). And then repeat the steps above, but instead of using “ButtonWidget” service we started with earlier (the “+if” part of the setup)...you will use the “AmazonAlexa” service. Alexa requests do not need underscores, FYI. If you don’t have Alexa, you can still use voice with Google Assistant to enter carbs, set or cancel temp targets, log site changes, etc. From the ‘THIS’ of the New Applet screen, select Google Assistant. Like the other services, you will have to allow it access. Under “What do you want to say?” type out what you’ll say when you want to enter carbs and use “#” where you will say the carb amount. For example, “enter # carbs”. If you are going to make a distinction between meal and rescue carbs make sure to do that here. If you think you might occasionally use a different phrase, such as “I’m going to eat # carbs” enter it under “What’s another way to say it?” This is optional. 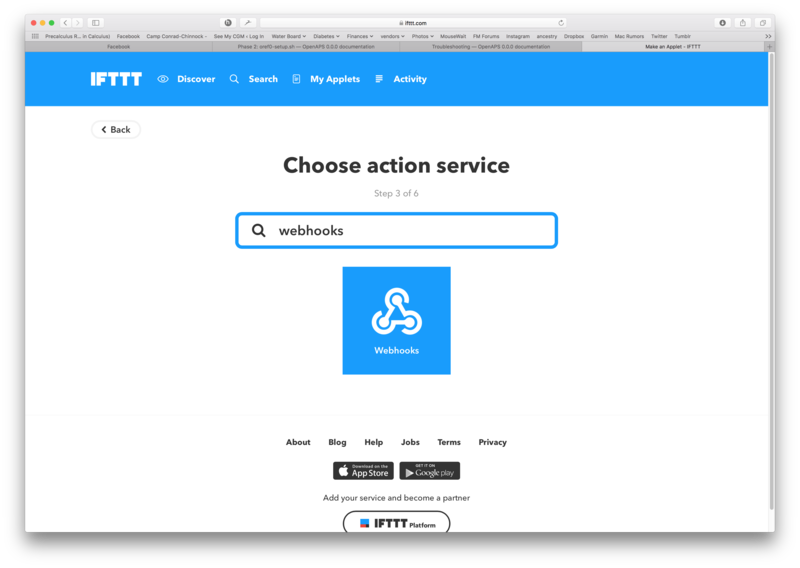 From the ‘THAT’ of the New Applet screen, choose the action service called Webhooks. 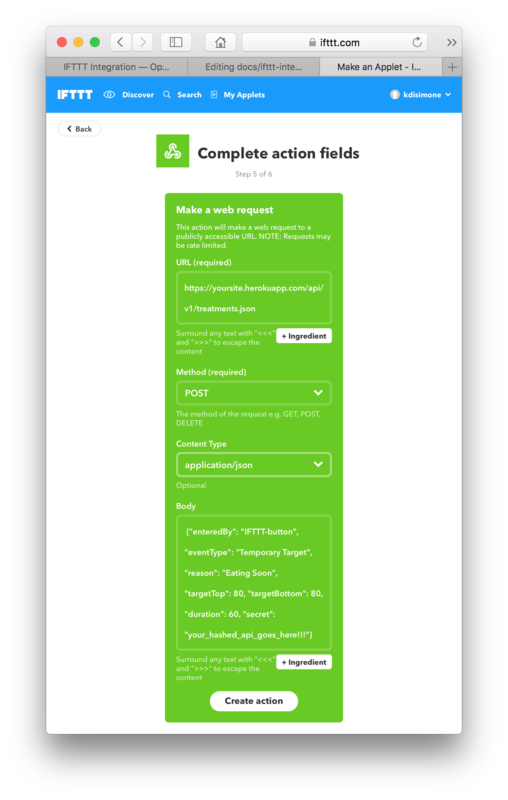 Select “Make a web request.” Your THAT will be ALMOST identical to Webhooks recipes created for the Button (as explained above). Instead of the exact number of carbs you want to enter, under the Body field, click “Add Ingredient” then “NumberField”. Using the Google Calendar Applet with IFTTT is useful to trigger temp targets that may occur on a recurring schedule, although you can also schedule a one-time event in advance as well. 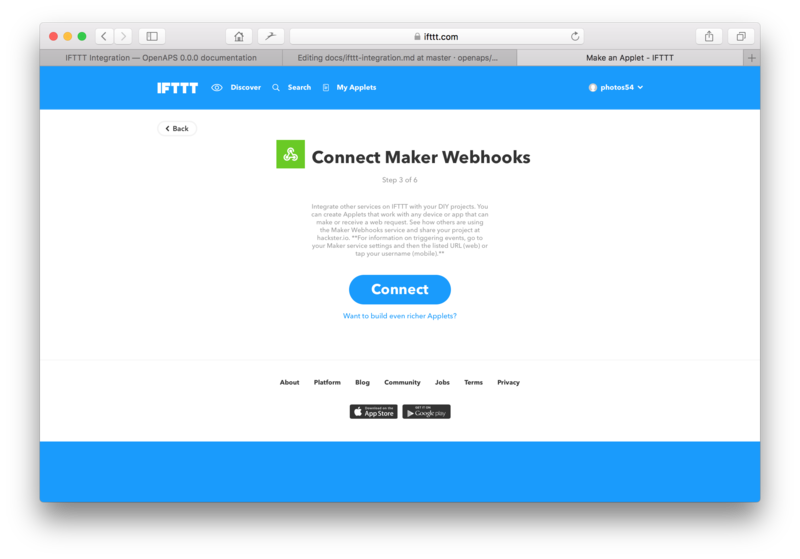 If you already have IFTTT/Maker requests working it’s easy to add. Follow the directions for Setup for Phones above, but rather than choosing “Button Widget” type “Google Calendar” in the search field and then click on the box labeled “Google Calendar”. You will need make sure to allow the Google Calendar Applet access to your Google Calendar. When you do this it will ask which calendar you want to connect. 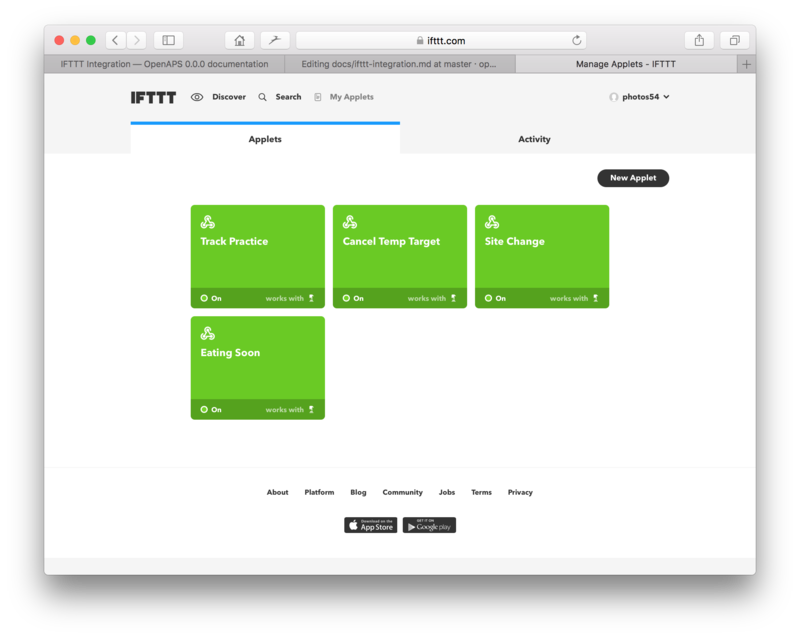 You can use your main calendar, or a calendar you’ve set up especially for IFTTT events. You’ll need to do this ahead of time using the administrative functions of Google Calendar. To do this click on the gear icon at the upper right of Google Calendar (google.com/calendar, not the Applet in IFTTT), choose settings, choose the calendar tab (upper left) and then click the button to make a new calendar. Call it whatever you want and set permissions as appropriate. Once you’ve connected the appropriate calendar, continue your setup in IFTTT and choose “Event from search starts”. Type a phrase that you’ll use on the Google Calendar to denote a temp target (or other event). For example “Eating Soon” or “Activity” and then click the button that says create trigger. 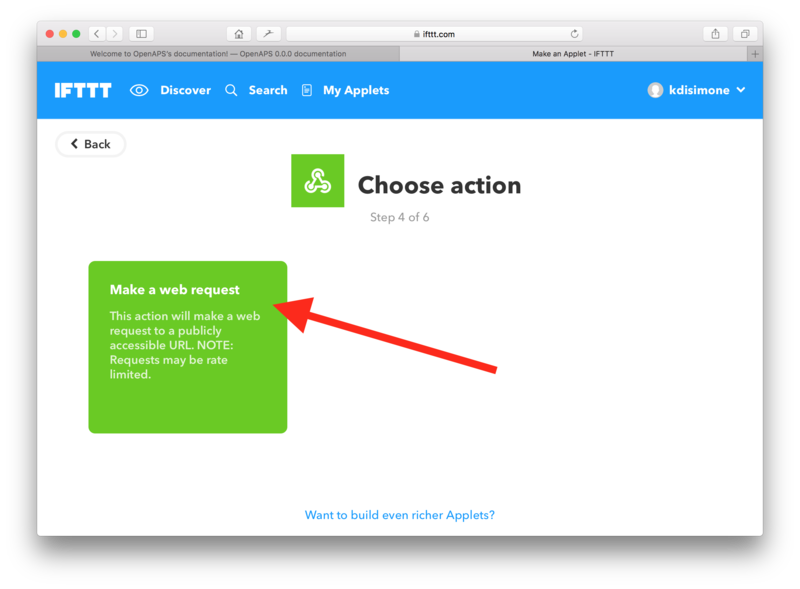 Click on the blue “+that” text and continue to follow the directions as above from Setup for Phones above to connect the Maker app and make the appropriate Web request. Now on your Google Calendar (make sure you create the event on whichever calendar you’ve connected to the Google Calendar IFTTT applet) you can create recurring events or one-time events to trigger temp targets. Use the same phrase that you used to create the trigger (Eating Soon, Activity, etc). For example, if you get up every day and eat at the same time during the week, schedule Eating Soon on those days at the appropriate time. If you know you’re going to take a day off work or school just remember to delete the event ahead of that date, or change as appropriate. Gym class for a child or sports practice only some days of a month? Sit down and schedule Activity Mode for those dates well in advance so you don’t have to remember at the time and they’ll trigger automatically.